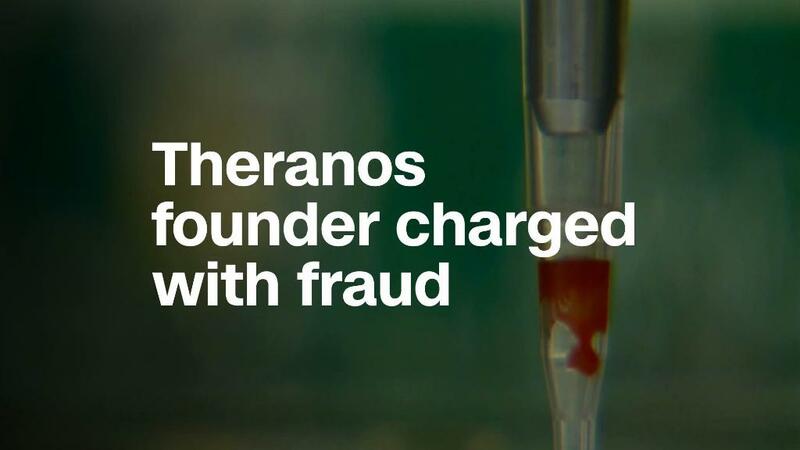 Theranos founder Elizabeth Holmes, who promised to revolutionize blood testing, has been charged by the SEC with a "massive fraud" involving more than $700 million. Former president Ramesh "Sunny" Balwani was also charged. The two raised money from investors "through an elaborate, years-long fraud in which they exaggerated or made false statements about the company's technology, business, and financial performance," the SEC said Wednesday. Theranos and Holmes agreed to resolve the claims against them, the SEC said. Holmes will give up control of the company and much of her stake in it. The SEC said it would take its case against Balwani to federal court in San Francisco. Theranos is a Silicon Valley startup once valued at as much as $9 billion. It was formed in 2003 by then 19-year-old Elizabeth Holmes, who dropped out of Stanford University to launch the company. It was considered an industry disruptor that aimed to create cheaper, more efficient alternatives to traditional medical tests. But it's been rattled by controversy following a 2015 Wall Street Journal report that questioned its technology and testing methods. The company has since voided two years of blood tests, faced federal probes and pivoted away from blood testing. Elizabeth Holmes declined to comment through her attorney. Jeffrey B. Coopersmith, a partner at Davis Wright Tremaine who represents Balwani, called the SEC action against his client "unwarranted." "Sunny Balwani accurately represented Theranos to investors to the best of his ability," Coopersmith said in a statement. Coopersmith said Balwani invested millions of his own dollars into Theranos and "never benefited financially from his work at the company." Theranos' independent directors issued a statement, saying "the company is pleased to be bringing this matter to a close and looks forward to advancing its technology." According to the complaint against Theranos and Holmes, she and Balwani knew that its proprietary analyzer could perform only 12 of the 200 tests it published on its patient testing menu, something the Wall Street Journal hinted at in its first expose on the company. The SEC said Theranos misled partners about its technology, and it allegedly used modified third-party machinery instead of its own to process some tests. The SEC also said it lied about revenue projections and claimed to investors that regulatory approval for its testing technology was voluntary when it wasn't. Theranos compiled a binder for investors that included reports on clinical trials it said it had performed with pharmaceutical companies. But only one of the reports was co-written with a pharmaceutical client, according to the complaint. Two were written by Theranos employees. Moreover, Theranos and Holmes made "false and misleading statements" in press accounts to bolster the startup's profile. It then allegedly used those articles to generate financial interest. "In some instances, she and Theranos provided some of the articles containing untrue or misleading statements to potential investors," the complaint states. The company was also said to be "on the verge of bankruptcy" in late 2017. Theranos' reputation was inflated over the years with the help of some profile figures, including former secretary of states, Henry Kissinger and George Schultz, former secretary of defense William Perry, and senators Bill Frist and Sam Nunn -- all were once board members. Current secretary of Defense James Mattis, a former Theranos board member, cut ties with the startup ahead of his 2017 confirmation hearing. Their ties with the company could have helped Holmes make it seem plausible that Theranos had a history of working with the Department of Defense -- something touted to mislead investors, according to the SEC. In 2016, The Wall Street Journal reported Rupert Murdoch, the executive chairman of the publication's parent company 21st Century Fox, had invested $100 million in Theranos. But he'd never been publicly linked to the startup. One of the Therano's investors sued the company the same year for its $96.1 million in funding money back after alleging securities fraud. The investment firm invested in the startup in February 2014. At the time, Theranos released a statement: "The suit is without merit, the assertions are baseless, and the plaintiff is engaging in revisionist history." The lawsuit between Theranos and Partner Fund Management was settled last year.